NASA's space shuttle Endeavour is nearing the end of its final space voyage to the International Space Station, but not before delivering some high-tech and oddball science experiments to the outpost — among them, two spiders, a swarm of fruit flies and countless tiny roundworms. These animal astronauts aren't pests or stoways; they're participants in the many scientific experiments Endeavour's final flight is making possible. Some of these projects are taking place aboard the shuttle, while others are longer-term efforts that astronauts will perform on the station. The most ambitious of these projects is a huge astrophysics experiment called the Alpha Magnetic Spectrometer. Getting the $2 billion AMS aloft and installed on the orbiting lab was the chief purpose of Endeavour's mission. Astronauts succeeded in the task on May 19, when they attached the bus-size, 7-ton AMS to the space station's backbone. This still from a NASA video shows one of two venemous golden orb spiders in an enclosure on the International Space Station. The spiders, Gladys and Esmerelda, were delivered to the station by NASA's shuttle Endeavour during the STS-134 mission in May 2011. Meanwhile, inside the station, a 45-day experiment involving the spiders and fruit flies has already begun. Biologists are studying the arthropods to see how weightlessness affects their behavior and development; researchers are particularly interested in how well the spiders spin their webs in microgravity. 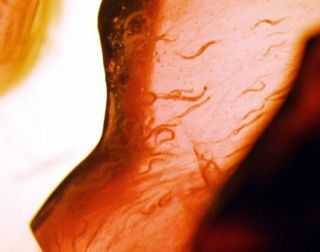 The roundworms, for their part, will help scientists work the kinks out of a fancy light microscope aboard the space station. Researchers suspect high vibration levels could affect the operation of the microscope; they'll use the instrument to observe the worms, along with other organisms and objects, to see if this is so. By an odd coincidence, some of the roundworms being used for this experiment, are descendants of individuals that survived the space shuttle Columbia accident in 2003. Columbia's STS-107 mission ended in tragedy when the orbiter broke up during re-entry, killing all seven astronauts aboard. Another notable experiment is a trial of new automated navigation technology that could make it easier for spaceships to rendezvous and dock at the station. Endeavour is putting this system, called Sensor Test for Orion RelNav Risk Mitigation (STORRM), to the test in space for the first time. One experiment, for example, will swab astronauts' skin, noses and throats to get a better idea of which microbes could set up shop on the station and cause infections down the road. Another one will hang some next-generation materials outside the orbiting lab, to see how they hold up in the harsh space environment. Some of the projects Endeavour delivered are educational in nature, designed to engage Earthbound kids in math and science. The shuttle brought up a bunch of Legos, for example. Station astronauts will build simple Lego models, then use them to demonstrate science concepts and show the effects of weightlessness to kids watching 220 miles (354 kilometers) below. Astronaut Koichi Wakata conducts the "Magic Carpet" activity as part of a session of Try Zero-G experiment on the International Space Station. Another educational experiment is called "Try Zero-Gravity" and was delivered to the space station by Endeavour's crew for the Japan Aerospace Exploration Agency. Like the Lego kits, this experiment includes supplies that astronauts can use to teach students the difference between gravity and weightlessness. It allows the public and students to vote on different physcial activities they would like to see astronauts demonstrate in weightlessness so that they can be compared with the same actions performed on Earth in educational programs. "Some of tasks include putting in eye drops, performing push-ups on the ceiling, arm wrestling, and flying a magic carpet," according to JAXA experiment description. Endeavour's six-astronaut crew will leave the space station late Sunday (May 29) and returin to Earth June 1 to wrap up a 16-day mission to the International Space Station. The flight is the 25th and final voyage for Endeavour, which is being retired along with the rest of NASA's shuttle fleet this year.